A number of artists featured in the special exhibition Of Heaven and Earth: 500 Years of Italian Painting from Glasgow Museums are represented in the collection of the Milwaukee Art Museum. This is the fourth in a series of blog posts that will highlight Milwaukee’s paintings during the run of the exhibition. Italian baroque painting can be bold, dramatic—and downright gruesome. Artememsia Gentileschi’s Judith Slaying Holofernes or Caravaggio’s David with the Head of Goliath are two great examples. The theatricality is in part a result of the demands of the Catholic Church, which was reacting to the Protestant movements spreading throughout Europe. Their response was called the Counter-Reformation. In order to encourage a return to Catholicism, the Church commissioned art that would capture the viewer’s attention with drama and emotion. But not all Italian Baroque paintings are blood and guts. Some can draw in the viewer with a quiet, contemplative air. One such painting is the Milwaukee Art Museum’s St. Dorothy by Antiveduto Gramatica (Italian, 1571-1626). That said, St. Dorothy’s story does have its violence. She was an early Christian virgin who was matyred in the city of Caesarea in Cappadocia, which is in present-day Turkey. She was brought before the governor, who persecuted Christians, and was told she must worship the pagan gods or die. Her response was that she would gladly accept death in order to join Christ, her betrothed, in the garden of Paradise where fruits and roses are always fresh. When led away to her death, Dorothy was mocked by a lawyer named Theophilus. He asked for some of the fruits and flowers when she got to heaven. At the place of her execution, a young boy suddenly appeared with a basket full of fruit and flowers even though it was winter. Dorothy asked him to take the basket to Theophilus and tell him who sent it. Theophilus ate the heavenly fruit and was converted, eventually becoming a martyr himself. Despite the threat of death, in our painting Dorothy turns her head gently to side, her eyes downcast, elegantly holding out her basket of fruit and flowers. Although a young girl, she awaits her fate calmly. Her pose conveys her tranquil inner thoughts. Aspects of Baroque style add to the mood of the painting. The use of strong chiaroscuro—or the use of light and dark from one light source—to show St. Dorothy as three-dimensional against a dark background makes her seem like a lone actor on a stage. She is show three-quarter length at practically life-size and very close to the picture plane. Standing in front of her, you feel that she is right there in your space. Her basket comes out towards us, as if she is handing it over. Talk about an emotional appeal to join her in the faith of the Catholic church! The great artist Caravaggio that I mentioned at the beginning of this post actually studied for a short time in Antiveduto Gramatica’s workshop. After the younger artist started his own career, the teacher adopted some of the popular techniques of his star pupil. When Caravaggio died at the young age of 37, Gramatica was one of the many artists who filled the demand for paintings of his style. 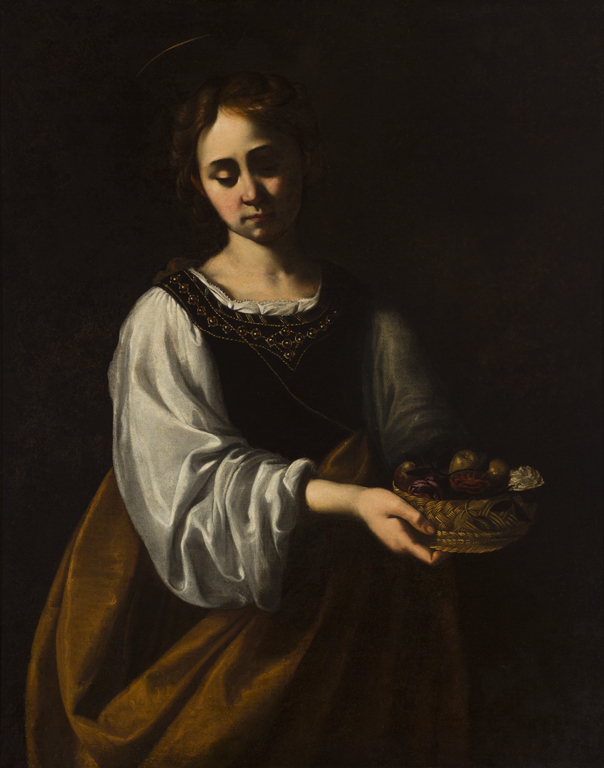 Although we are not lucky enough to have a Caravaggio, we do have a lovely Gramatica to represent the Italian Baroque. When our collection galleries reopen in 2015, you might see the Milwaukee Art Museum’s painting by Antiveduto Gramatica. In the meantime, you can see a lovely example of Gramatica’s work in the feature exhibition Of Heaven and Earth: 500 Years of Italian Painting from Glasgow Museums, on view at the Milwaukee Art Museum through January 4, 2015. This entry was posted in Art, Curatorial, Exhibitions and tagged 17th Century Art, Collection, European art, From the Collection. Bookmark the permalink.